You are only as old as your spine is healthy. Your spine and pelvis form the structural center of the body and also the protective housing for the central nervous system which the master system of the body, responsible for perception of the world around you and control of all functions inside the body. Your spine has three parts: Passive, active and control. The passive part includes the bones (vertebrae) and disks. These are passive because they can only move where they are pulled by the active part which is the muscles around the spine. The control part is the central nervous system which tells the muscles when and how to work and therefore directly controls the whole spine. The nervous system is like, the conductor of the orchestra; the muscles are the musicians and the bones, the instruments. The passive and active parts continuously send messages to the control part, which helps the control part be a better conductor. It’s like a perfect team. A healthy spine is just that; a perfect team. The three parts work in perfect harmony and balance with each other. The bones maintain an optimal position with very low stress on the joints and disks. This is seen as good spinal posture. The muscles know how to keep the bones and disks in the most appropriate position for the demands of every moment. This prevents damage when moving, lifting, twisting etc. A healthy nervous system (control system) is vital or the whole system breaks down, a bit like an orchestra with a bad conductor. A healthy nervous system makes sure that the spinal muscles know when to relax and rest when they don’t need to be tense. This is important or else muscles get tired and painful and become bad workers. A healthy nervous system always keeps one eye on the inside of your body and the other eye on the outside world to make sure you adapt to the challenges of life in a productive way. Adaptability is the secret to health. What is an unhealthy spine? Persistent aches, pains and tension around the pelvis, back and neck areas. Problems with shoulders, hands, knees, legs and hips. Difficulty in bending, twisting or turning. “Cracking” sounds coming from the back and neck when moving. Difficulty taking a satisfying deep breath. Uneven wear on the soles of shoes. Difficulty finding a comfortable position in bed. Persistent feelings of stress and low energy levels. 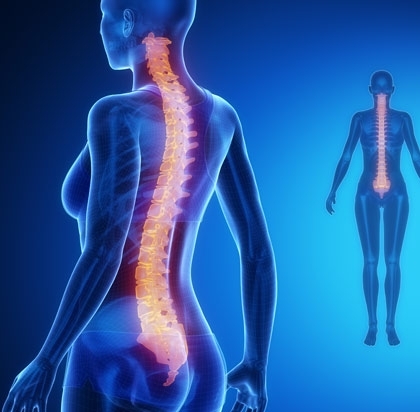 What causes an unhealthy spine? The short answer is stress overload, but we must clarify what we mean by stress. The spine is subject to both physical and psychological type stress. Physical stress occurs with too much or inappropriate exercise like too much lifting and twisting, especially with heavy objects and bad lifting technique. Physical stress primarily overloads the passive and active parts which then lead to tired and tense muscles and damaged joints and disks. Psychological stress is a different story. This type of stress overloads the control center (the central nervous system) which makes life very difficult for the spine and the rest of the body. When the nervous system gets overloaded with psychological / emotional type stress it switches into ‘defense mode’, which is like a ‘shutting down’ of the system for protection. Defense mode results in the active muscles locking into a state of continuous tension, which makes life difficult for the bones and disks, which again can lead to arthritis and disk problems. This is why people feel more aches and pains when they are ‘stressed out’. Long term nervous system defense also interferes with your immune, hormonal and digestive systems, which are all controlled from nerves that come from the spine. It’s like an orchestra who’s conductor gives up half way through a concert and leaves the players to struggle through by themselves. In the spine, ‘struggling’ feels like you can’t move with the freedom you want, you are afraid to do physical activities you enjoy, and you feel constant restriction in your body. This is what happens when the nervous system is stuck in ‘defense mode’ and does not have the strategy to get out of it. Many people lift something or make a simple every day movement and hurt their back and blame the object lifted or the movement. The truth is that when the nervous system is exhausted, the spine becomes so vulnerable that even small physical movements lead to damage. Chiropractors use their hands to perform specific chiropractic techniques called spinal adjustments or entrainments, which gently realign the spine, taking tension of the nervous system and therefore off other areas of the body. There are many techniques used by chiropractors depending on their style of practice. The most holistic, gentle and far reaching technique is called ‘Network Spinal Analysis’ which involves gentle painless contacts with the hands on areas of the spine where the brain and body have the strongest connections, combined with different breathing techniques. The result is that the 3 parts of the spine, passive, active and control start to work with coordination and harmony. Your spine starts to move more freely. You start to feel you are in control of your spine. Chiropractors do not; prescribe drugs, provide injections or perform surgery, this remains the field of medical doctors. Research studies in England, Australia and USA have shown chiropractic patients to have good results in the reduction of blood pressure, asthma and digestive problems, psychological stress and overall quality of life. The Chiropractic approach has been shown to be not only effective but extremely safe, with no dangerous side effects. For this reason, in countries where Chiropractic is better known many people are turning to chiropractic first before more dangerous interventions like drugs and surgery. Increasing numbers of people in are also using chiropractic even when they are well, in order to maintain good health and prevent future problems.